Posted in: Public Outreach, Teaching. Tagged: career development. 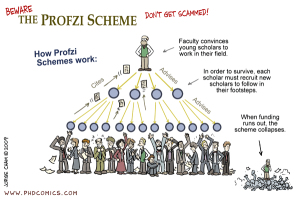 To say getting a job in academia is difficult is an understatement — a recent study showed something like one in 8 PhDs will manage to find a faculty position. Fortunately, the overall unemployment rate among STEM PhDs is low, less than 2%, so there’s lots of good alternatives. For myself, I was fortunate to have lots of support from family, friends, and colleagues, but the academic job search was excruciating. Usually the process of getting a faculty position involves a series of interviews, and among them, the phone interview was particularly stressful for me because it often lacked the non-verbal channel that constitutes a huge fraction of human communicative bandwidth — there’s nothing worse than interrupting one of your interviewers while they’re still trying to get a question out. In prepping for my phone interviews, I came up with a few strategies that I’ve recently shared with friends who are currently applying for jobs. On the off-chance that they might be helpful generally, I’ve described them below. Usually, the phone interview involves being asked a series of questions (sometimes scripted) from members of the hiring committee at the department to which you’ve applied. I found that I often struggled to come up with good answers on-the-fly, so, after a few poor performances, I wrote up answers to questions I’d gotten in previous interviews or ones I anticipated. Then I laid them out on tables in a circle around me in my office, so I could easily find an answer to a question, if asked. I didn’t read the answers verbatim, but the notes were extremely helpful for keeping my answers concise. I found it very easy to ramble on, trying to find the words you think the committee is looking for. “How do you think your research program would fit into the department? Who would you work with here?” I had already done extensive research on every faculty member before an interview, even those not in my field of astronomy. Not that you’ll work with them, but unless you’re interviewing with a department that specializes in exactly your field, you’ll probably have some folks from different fields involved with your interviews. “What classes could you teach?” For this question, I sifted through the course catalog so I could point to specific classes they already offered before suggesting new ones, but good chance they’ll ask about both kinds. “Why do you want to work here?” I tried to mention specific things about the school and department, not just answer “because you’re hiring”. research?” I had one or two specific projects in mind, as well as thoughts about how I would support the students’ career development. “What resources will you need to continue your research?” Especially important when I interviewed with smaller places that didn’t have all the resources of a larger place. “What are your public outreach plans?” In my case as an astronomer, I looked up and contacted local amateur astronomical societies to ask about what they were up to and how I might help if I came to town. 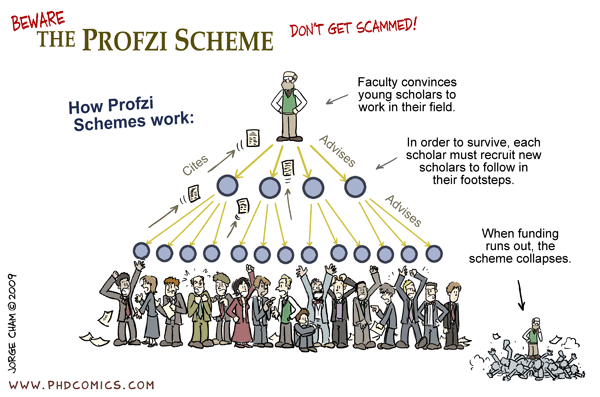 “How will you fund your research? What specific funding programs could you apply for?” In my case, I’d already applied for several grants and served on grant review panels, so I had some specific ideas. interviewing for a job in a smaller town since they might be concerned you’ll get bored and look for a new job soon after arriving. “Where do you see yourself in five years? What goals do you have for your research/funding/teaching?” Pretty standard, but good to have specific ideas about how your research/teaching might develop. Most people know you can’t know exactly, but they’ll be interested in your broad vision. “How will you balance teaching and research?” I got asked this one a lot, and it’s especially important to have an answer if you haven’t done much teaching before. “Where is the department going in the next few years?” Always fun to turn this question back around on the hirers. If you’ve got any comments or corrections, please pass them along. Happy Holidays. The illustrious Laura Kreidberg (https://twitter.com/lkreidberg/status/1070389734432743424) suggested adding the question “How would you support students from diverse backgrounds and encourage inclusion in the dept?”. I could imagine that being asked by the interviewers or it might be a good question for an interviewee to ask to gauge a department’s commitment to equity issues. 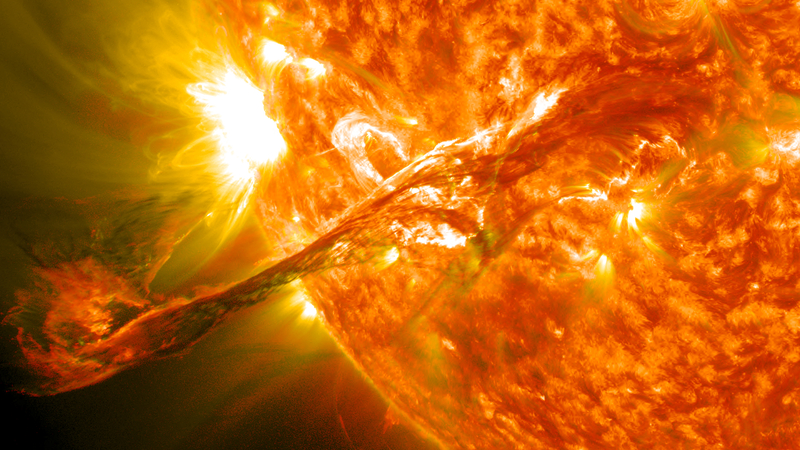 Solar coronal mass ejection. From https://en.wikipedia.org/wiki/Solar_flare. 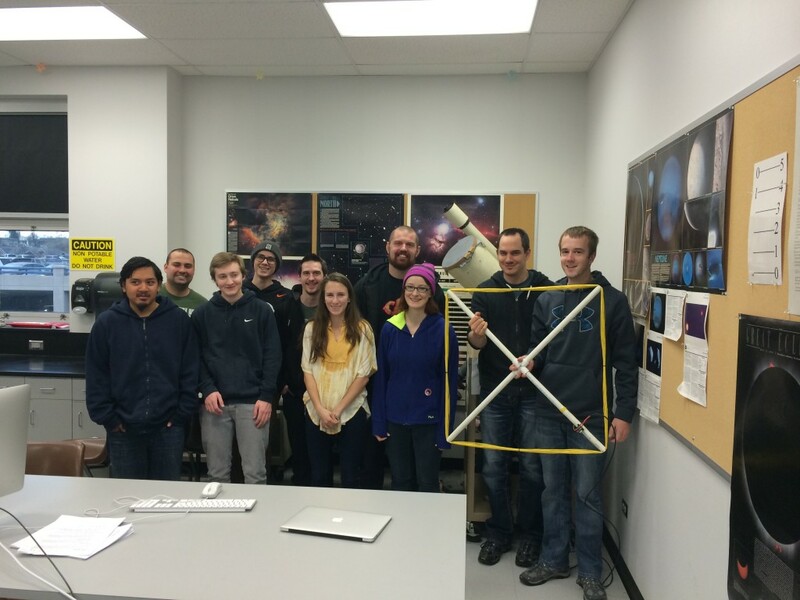 In my PHYS204 – Planetary Astronomy lab today, the students gave final presentations on their semester projects. This semester is the first time we in the Physics Dept have offered the Planetary Astronomy class, and as an experiment, I asked the students to break into several groups and gave each group a research project. These projects are legitimate research projects, not simplified exercises, so they were quite challenging for the students, who have little to no research experience. But the students did an excellent job, overcoming a variety of hurdles, from taming stellar evolution models to wrapping hundreds of feet of wire to build a radio antenna to detect solar flares. I asked the students to keep a wiki, describing their projects and progress. Their presentations are also available. Many of them will continue on into the PHYS205 – Stellar Astronomy class and keep pushing their projects forward. Posted in: Brian's Presentations. Tagged: astronomy, close-in exoplanets, exoplanets. Last week, I had a lovely visit to the Astronomy Dept at New Mexico State University in beautiful Las Cruces. I was invited to give one of the dept’s weekly colloquia about our research group’s work on very short-period exoplanets. While there, I talked dust devil science with my host Prof. Jim Murphy, his student Kathryn Steakley, and Lynn Neakrase. I also enjoyed some excellent Mexican food at the Double Eagle Restaurant, which has been haunted by the ghosts of two young lovers since just after the Mexican-American War. 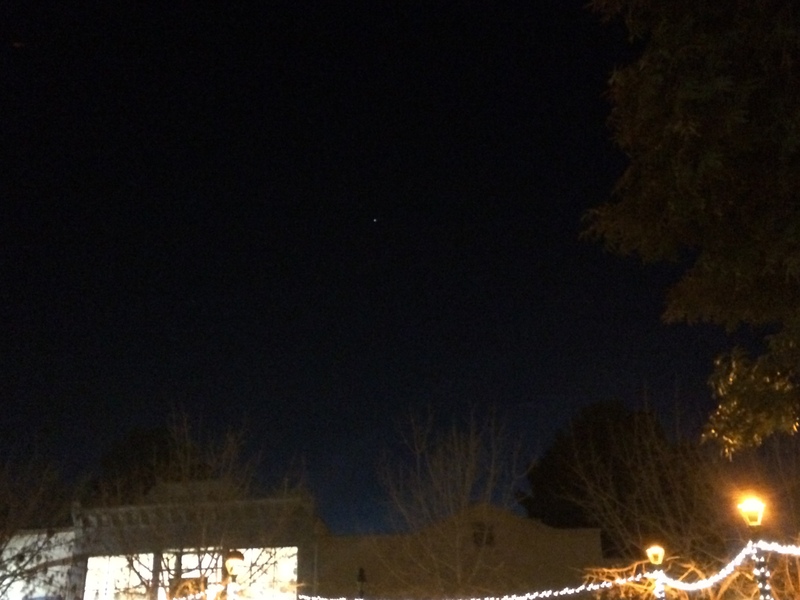 The International Space Station passing over Mesilla, NM on 2015 Dec 4. Just before dinner, the ISS also passed directly over our heads, and I got a very poor photo of it (left). So, all in all, a great visit. I’ve posted my abstract and presentation below.